It was generations ago, when Fei’s people lost their hearing. But not being able to hear hasn’t hindered her people. It’s the life they live, trapped on top of a barren mountain, that hinders them. Fei’s people must mine precious metals in return for food, which is shuttled up the mountain via zipline from the kingdom below. But the villagers are beginning to lose their sight as well, and their mining production is going down as a result. As punishment, the kingdom below sends less food and the village is falling into crisis. One night, Fei wakes experiencing a strange new sensation. Sound. And it’s the sound that will become her weapon. Fei gathers her courage and decides to take matters into her own hands. Through her journey, she discovers a startling truth that turns everything she has ever known upside down. First and foremost, I loved that this was a standalone. Second, it was short (I read it in a day). Third, it felt so much like reading an old fairytale that I instantly loved it for that. I have heard/read that a lot of people are disappointed in “Soundless", and it’s pretty clear why in the story. There are a lot of things that don’t really make much sense, or felt thrown in and kind of random. Not to mention the magical element felt kind of thrown in as an after thought. Having said that, I forgave much of that just because of the fairytale feeling I was getting. Most fairytales are vague in setting and reasons why things are the way they are. Or the reasons are just good enough to get the hero on his/her journey. 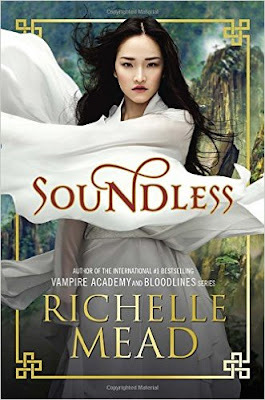 That’s what "Soundless" was like for me, and I was more willing to let go of things that I wouldn’t have in other novels. Plus I found it really interesting to think about what it would really be like to describe hearing after never ever having it before. So what I’m trying to say is, I enjoyed this. It was the perfect read for my Thanksgiving day. Yes, I can agree with the people who haven’t liked it, but at the same time, for me, for reasons I can’t quite explain, they didn’t bother me as much and I am happy to have this one of my shelf.